The 15th Citizens’ Action to Save Gangjeong will be held in Gangjeong on Saturday, November 10, 2012. 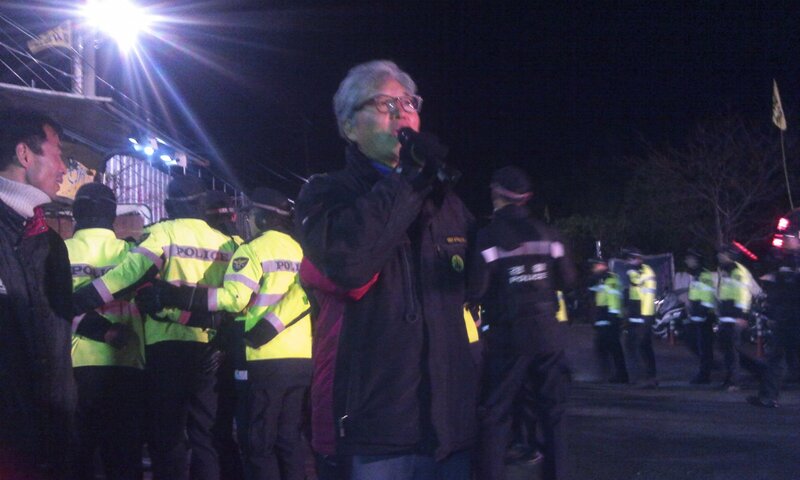 – Yang Yong-Chan, a true citizen of Jeju, greatly missed. 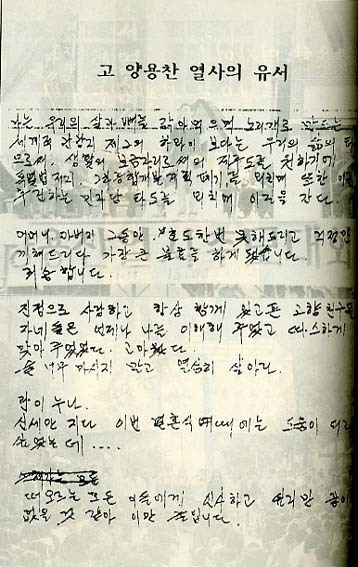 The above quote was part of testimony by Yang Yong-Chan (1965 to 1991) who immolated himself in Seogwipo City on Nov. 7, 1991. Today is anniversary of his death. He was only 25 years old. According to Prof. Shin Yong-In, legal advisor to the village association, there was a pan-Island resistance against the central government’s development drive in 1990s. 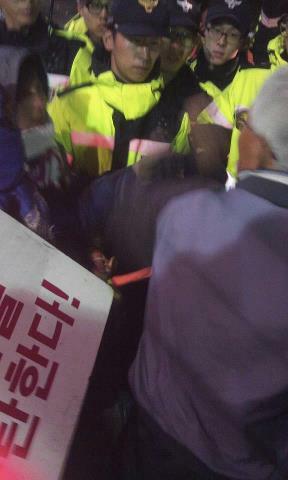 The Jeju Special Law has been nothing but legal justification for big corporations’ exploitation of Jeju. The immolation of Yang Yong-Chan who resisted against capitalist development of the Island sparked the Island people to rise up during that period. Because of Island peoples’ resistance, the Island government at the time was eventually forced to set up some important systems to preserve the pristine nature of Jeju from the central government’s thoughtless development. One of the most important systems is the Absolute Preservation System that is supposed to ‘absolutely’ protect the natural environment of Jeju, including its coasts. Ironically, it was the very governor Woo Keun-Min who established that very system as governor at the time (1991 to 1993). Woo becoming the Island governor again in 2010, but has not cancelled previous governor Kim Tae-Hwan’s undemocratic 2009 decision to abolish the Absolute Preservation Areas in Gangjeong village (the Joongdeok coast, most of which is called Gureombi Rock, as well as Gangjeong Stream and its vicinity) made in order to force the Jeju naval base project despite the Island Council’s demands at the general meeting vote in March 2011. “The cancellation of the Absolute Preservation Areas in Gangjeong in 2009 can be interpreted as the central government unilaterally infringing on indigenous rights to environmental protection, as well as their human rights and other creatures’ rights to live in their habitats,” Prof. Shin says. 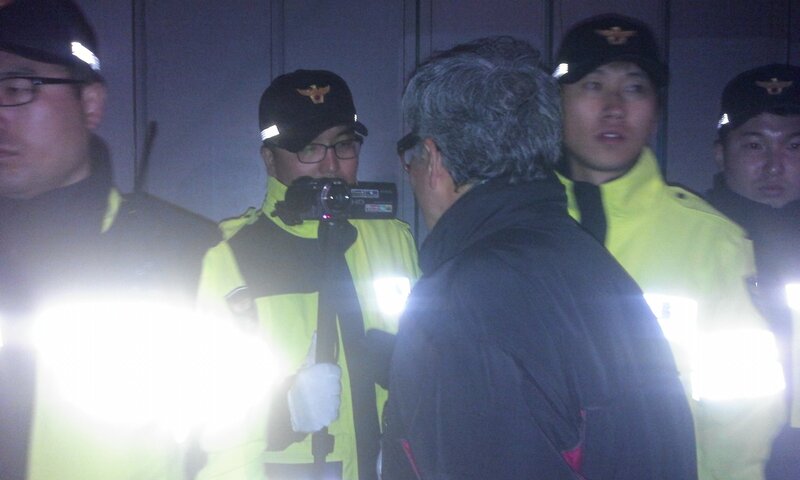 Current Governor Woo is affiliated with big corporations like Samsung, and is neglecting his duties as it is in his authority to order the navy to stop the illegal and forced Jeju naval base construction (destruction). His statements on faux so-called “Civilian-Military Complex Port for Tour Beauty” and the two 150,000 ton cruise ships are nothing but sugar-coated words to blind the Island people through false promises of local economic development. What is the difference between his period and our period? 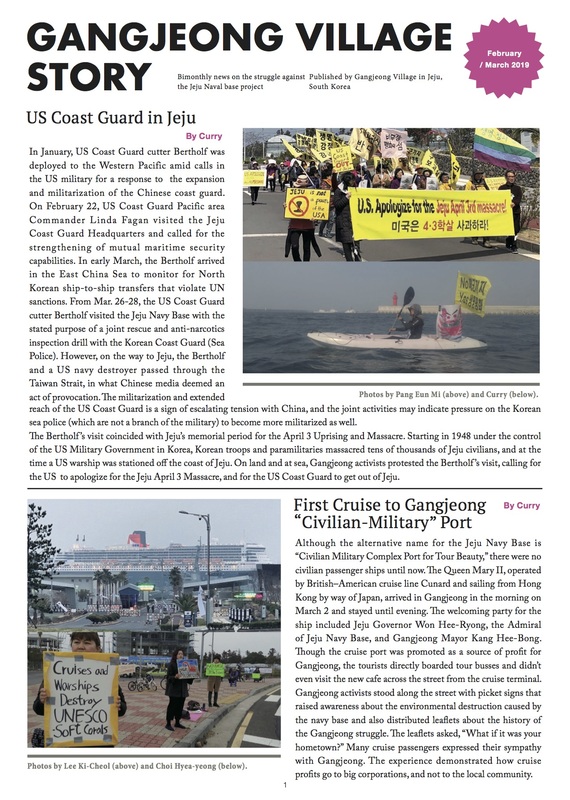 Jeju, designated the “Peace Island” by the central government on January 27, 2005, is now suffering greatly because of the enforced and unreliable war base construction in Gangjeong village. The right-wing conservatives repeatedly say that they want Jeju to become a 2nd Hawaii, mixing militarism and tourism (so that big corporations like Samsung can wholly exploit Jeju Island). 24-hour construction started on Oct. 25, 2012. The navy has gone insane enforcing construction (destruction) as they try to get the 200.9 billion Won budget for next year (92.5 % of budget will go to big corporations like Samsung and Daelim who are in charge of the harbor and bay construction). Even police from the mainland have been mobilized 24 hours-a-day to serve these companies will. The people have also responded increasing their protest to 24 hours-a-day, being carried by ambulance to hospital, injured, robbed of their sleep. Even the daily 7 a.m. peaceful 100 bows have been disrupted with police forcefully removing the bowers from the construction gates. Catholic priests in robes are carried away during mass only for construction trucks to pass through the gates. Women’s clothes are taken off and bodies scratched and pinched by police women nails when the policewomen forcefully remove them from the protest sites. Men are dragged on the ground by one leg. The people are uncared for especially in the night when the police only care about removing and throwing them aside as fast as possible. A woman was almost at the risk of losing her life when a policewoman neglected her after throwing her down on the 1st night 24 hour construction, October 25. 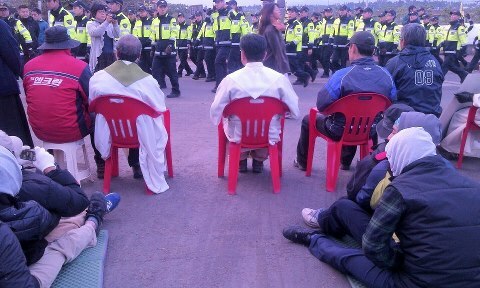 Catholic priests in robes are surrounded by the police during mass and removed from the protest site at around 5 p.m. on November 5. 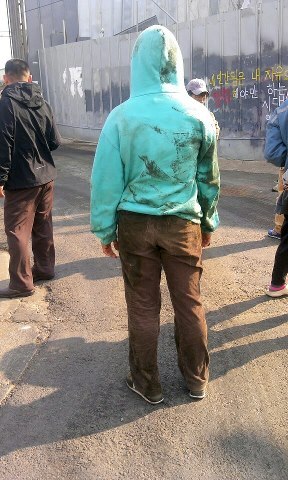 A woman peacekeeper’s dirty clothes after being dragged carelessly across the ground at around 3:30 p.m., November 4. Around 10:50 pm. on November 5, Chairwoman of the village Folk Conservation Association played music. Then police attacked. Still people, including village elders played music and held pickets, inside circle of police. Around 12:10 a.m. on November 6. 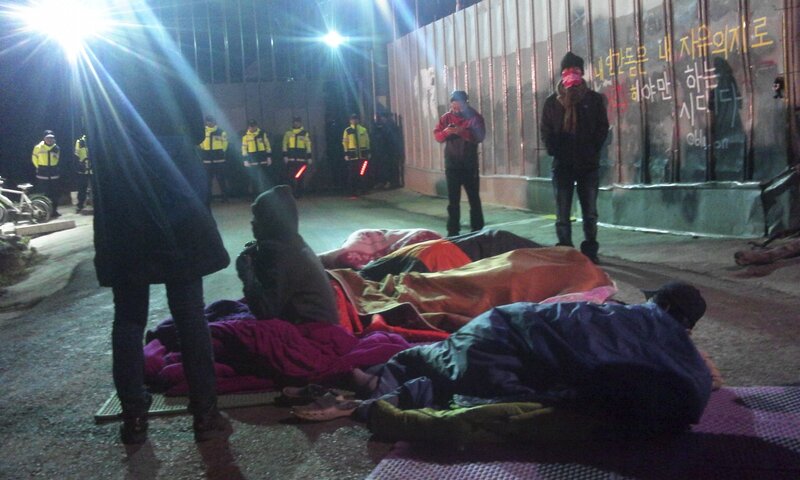 The police usually come every two hours during the night time, but this time it was only after 1 hour and 40 minutes. 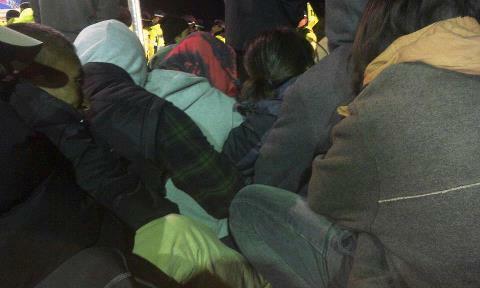 People in solidarity right before the police’s attack. 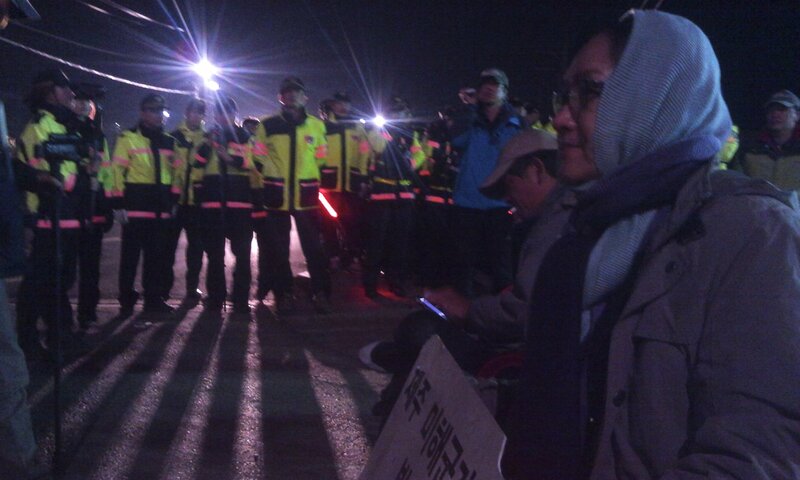 Since November 5th, the number of the police has increased even more. The police are wielding more physical power but still the people are resisting with all their energy. The intervals between police attacks have become shorter. During the day, it has shortened from the usual hourly strike, to every 30-40 minutes. During the night, from two hour intervals to every 1 hour and 30 minutes or 1 hour and 40 minutes. It is clear that the navy is getting more and more hurried with the destruction. Because of this people nationwide are mobilizing themselves to stop the 24-hour construction (destruction), to stop the navy and big corporations’ greed about the national budget, and to save Jeju, the Peace Island, following after the spirit of Yang Yong Chan, whose poignant words still ring true, that Jeju should be a site for life, not a second Hawaii. 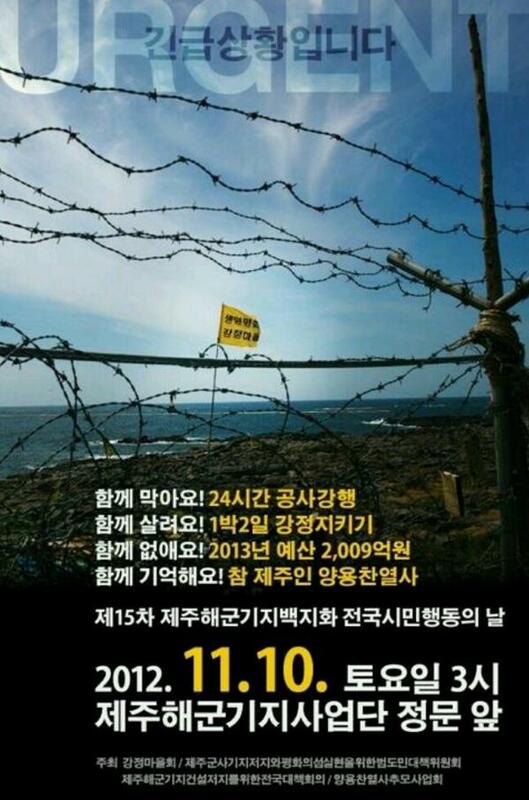 The 15th Nationwide Citizens’ Action Day to revoke the Jeju naval base project will be held on November 10. Let’s block together! 24 hour enforcement of construction (destruction)! Let’s save together! 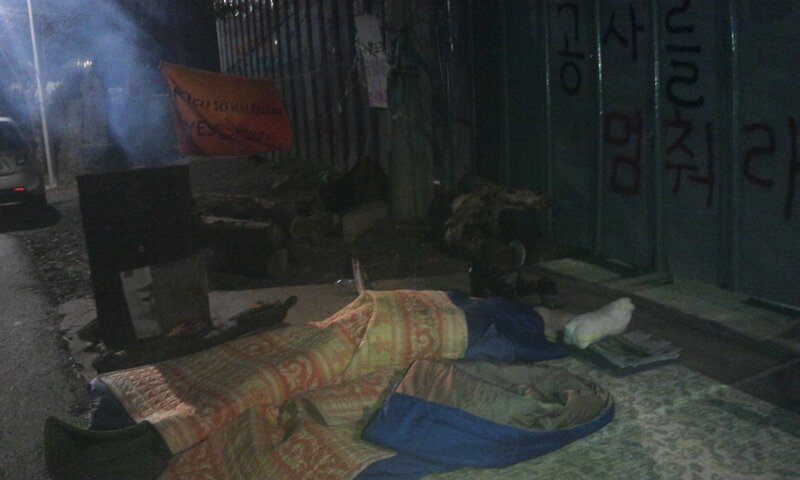 Save Gangjeong by staying over the night! Let’s cut together! 200.9 billion Won Jeju naval base project budget 2013! Let’s remember together! 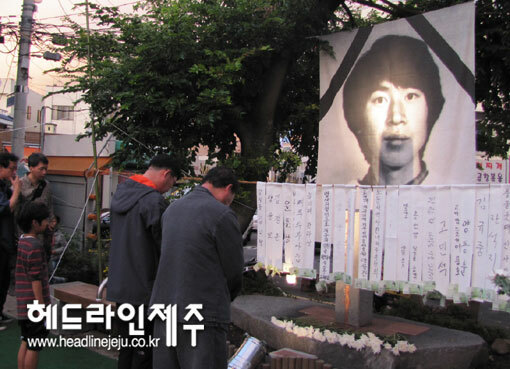 Yang Yong-Chan, a martyr, a true Jeju Island citizen!